Having trouble getting your kids to bed? Want them to help get ready for dinner/clean up after dinner? Bo is here to help! With Bo's Bedtime and Bo's Dinnertime, children will learn the steps for getting ready for bed, getting ready for dinner, eating dinner, and cleaning up after dinner all in two different interactive applications! Continue reading to learn more information about Bo's Bedtime and Bo's Dinnertime and to enter a giveaway to win one of these applications! Both applications share similar main pages. Press the "Play" button to begin application play. Otherwise, there is information for settings and about the application or a doll game users can play! Press the "i" button to head to the "Info" page. The Heppi icon will discuss how to play the application, information about the author, how to find Heppi apps on social media, a support page, leave a review in iTunes, credits, the version, and e-mail. The Book icon shows other books by Heppi. The music button turns on and off the music and sound. The "@" button shows social media for the company. Both applications have a doll dress-up game where you can press and drag different clothing items onto a male (Tommie) or female (Lulu) doll. You can then take a picture to save the doll to your photo roll. The games are also interactive. 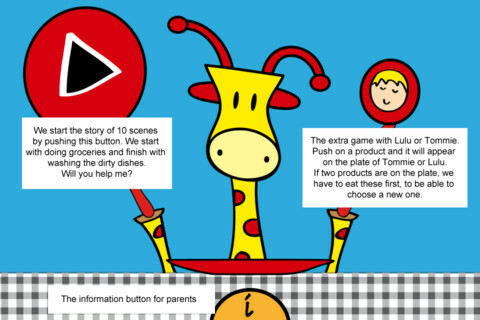 This application follows Bo the giraffe through a bedtime routine. It is interactive to help children learn about getting ready for bed. Here are some of the steps: putting toys away, putting clothes away, taking a bath, drying off, brushing teeth, matching/choosing pajamas, and reading a bedtime story. Some of the interactive elements include: choosing ducks for a bath, moving a teddy bear through a maze, and cutting goodnight kisses down from strings. This application follows Bo the giraffe through a dinnertime routine. It is also interactive to help children learn about getting ready for dinner, eating dinner, and cleaning up after dinner. Here are some of the steps: purchasing groceries, setting the table, cooking the meal, eating the meal, and washing dishes. Some of the interactive elements include: dragging groceries into cabinets, wiping the table with a cloth, and setting the table. They are both easy to use and if you do not have time to play all of the interactive elements, press the arrow buttons. These applications are both interactive on each and every page. There is sound and narration for each of the pages of the apps. The applications take children step-by-step through everyday routines. 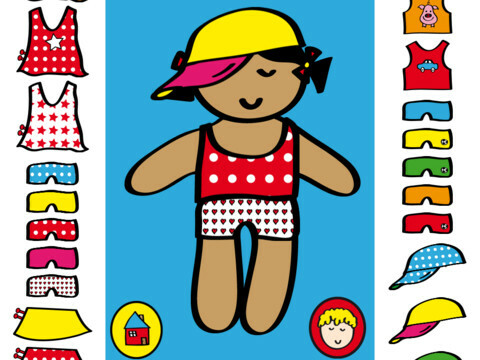 The visuals on the application help children follow the directions of the application and even sometimes will flash to show children which items to press. I would love it if you could have the narrator (Bo) re-state the directions within a page without having to move back and forth between pages. Receptive Language - Discuss different items associated with different parts of mealtime and bedtime (pot, pan, fork, knife, spoon, tablecloth, teddy bear, book, pajamas, etc.). Talk about which items go together. After playing through one of the apps, sequence the events together on what needs to be done to get ready for bed/dinner. Expressive Language - Have students write a diary about what they do to get ready for bed or for dinner. They can even draw a sequence of pictures to go along with it. Life Skills - After playing through these applications, students will know the process of getting ready for bed and getting ready for dinner as well as some of the individual tasks. Following Directions - Follow the directions stated by Bo on each page in order. Discuss directions for each individual task. Bo's Bedtime is available for $0.99 for the iPod Touch and iPhone as well as for the iPad for $1.99. Bo's Dinnertime is available for the iPod Touch, iPhone, and iPad for $1.99. 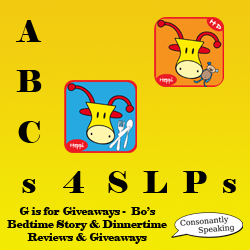 Heppi apps donated an application code for each of Bo's Dinnertime and Bo's Bedtime applications for this review. No other form of compensation was given. Enter the giveaway below to win one of the two applications in this review!